The Richloam Wildlife Management Area occupies 58,000 acres in Hernando, Pasco, Sumter and Lake Counties - and is one of seven large tracts that make up the Withlacoochee State Forest. Hunting, fishing, wildlife viewing, hiking, bicycling, camping and horseback riding are all popular recreational activities enjoyed in Richloam. The primary trailhead for access to Richloam is located south of S.R. 50 along Clay Sink Road at the Division of Forestry firetower. That location includes an information kiosk with trail maps and a list of all the hunt camp locations in the area. The trailhead is at the center point of three loop trails ranging in length from 9.4 to 13.6 miles. The trails may be hiked separately, or combined for a longer overnight backpacking hike. 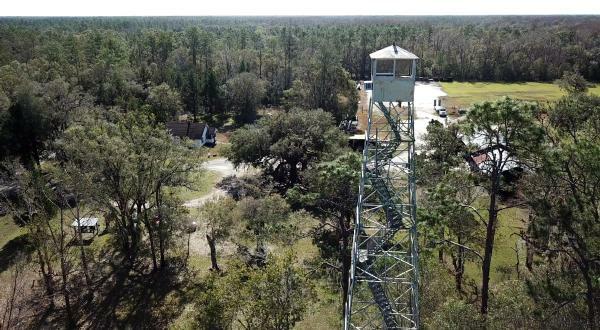 The firetower trailhead is also an entry point to the Florida National Scenic Trail, which follows a portion of the Richloam South Loop trail. The terrain consists predominantly of pine flatwoods with scattered oak hammocks, bottomland hardwoods, and cypress swamps. It is important to note that Richloam is a remote area serviced primarily by unpaved forest roads - some of which may not be suitable for two-wheel drive passenger automobiles. The trails are long and there are no facilities available. Cellphone service may be sporadic or non-existent. So hikers should be sure to bring all of the water and supplies they may need. Pack it in and pack it out. Located at the northwest tip of the Richloam Tract is the Little River Recreation Area with shorter multi-use trails for hiking, biking and equestrian use. That area is covered by a separate page on this website. The Division of Forestry firetower trailhead site has several other features worthy of mention. The first, obviously is the fire tower. As of this writing, the tower appeared to be open to the public ... with an unlocked gate and a sign warning that "Visitors ascend at their own risk". So if you ever wanted to climb to the top of a forestry fire tower, this may be your chance. Also, be sure to visit the nearby Richloam General Store. This historic general store and post office dates from 1922, and is listed on the National Register of Historic Places. It is open to the public and sells jams, jellies, canned and dry goods.